Wow! 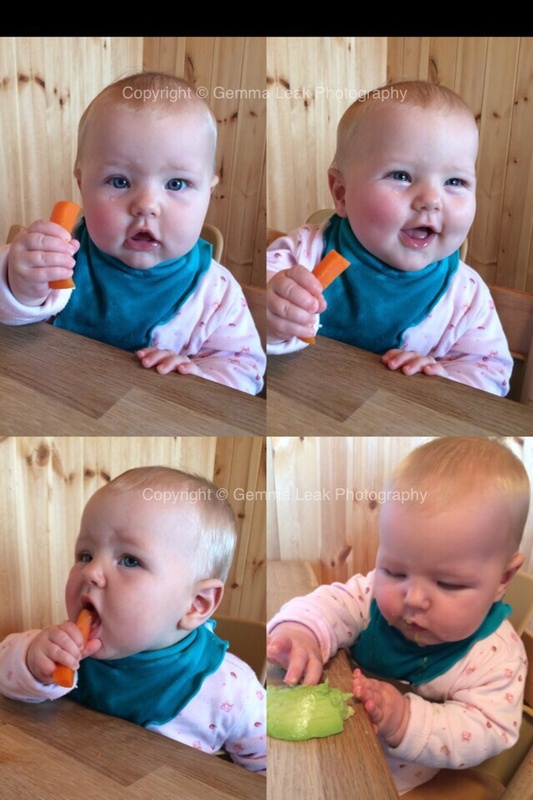 I watched with amazement as Ruby munched on carrot – she gagged a bit, spat some out, tried some more! She pulled some hilarious faces too. She seemed really disappointed when the carrot ran out so I quickly served her up a chunk of avocado. I helped her get a grip of the avocado (next time I’ll give it to her with some skin left on to help grip it). Ruby was super quick in getting the avocado in her mouth, she seemed to love the taste too. Within about 30 seconds it covered her face, hands, clothes and floor! Rosie’s a little worn out and under the weather today so I thought I’d make her a bunch of flowers to cheer her up. When Rosie saw it she said… ” Thank you for my special lunch, I love the beautiful flowers” 😊 .. She sure knows how to melt my heart! 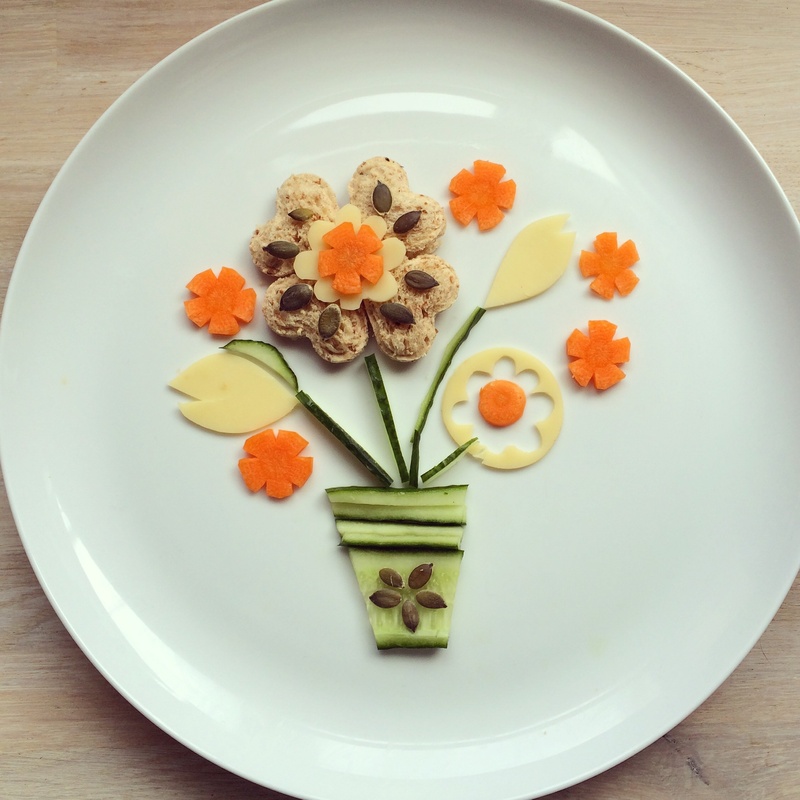 I made today’s snack plate super quickly as baby Ruby was not being very patient! Wholemeal bread, pumpkin seeds, emmental cheese, cucumber and carrot. The first item I tried out and I actually still use every day is the brilliant beaded necklace shown in the images below. This actual one may be sold out now but there are many more colourful different designs to choose from on the Gumigem website. We pegged it to a bouncy chair when enjoying some time in the garden. 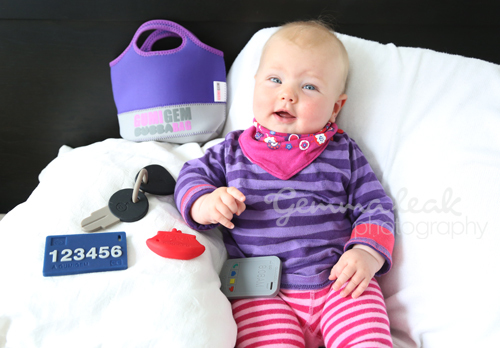 A handy piece of kit to wear when baby is in a wrap! We also received a bangle and a necklace from Chewigem (part of the same company as Gumigem) for Rosie to try out. As it happens, Rosie is actually quite in to chewing stuff. When she drifts off in to her own world (often whilst watching tv) she tends to chew whatever is in her hands, if there isn’t anything in her hands she chews her hands! I gave Rosie her little gifts and straight away she had a chew on them! Without me even telling her that these were great for chewing on. 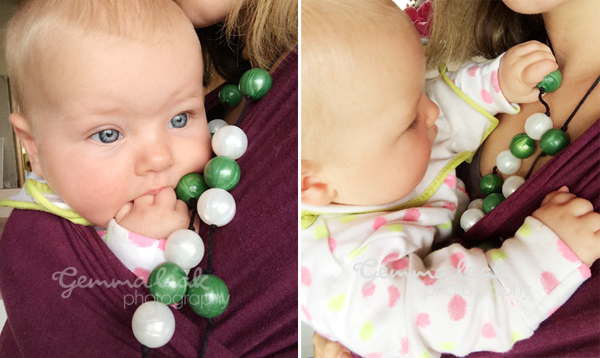 Here are a few shots of Rosie watching TV and chewing her jewellery … I think it’s safe to say, she likes them. At the moment these are the only bits of jewellery I let Rosie wear as I know they are totally safe for her to have a chew on. Ruby is shown above (very cutely I think) surrounded by the goodies that are included in the Bubbabag. This is a great little bag with 4 items in. 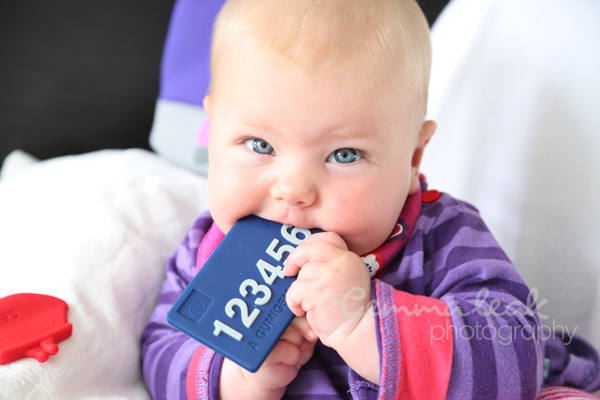 A phone, a cash card, keys and a purse, all of which are rubbery chewy treats for teething gums. Ruby is only 5 months old and at the moment she can’t quite co-ordinate herself enough to get the bits out of the bag herself, but she does enjoy chewing the bag! I’ve passed her all the items separately and I think her favourite is the cash card. She had a little chew on all the items, but I think this bag will really be useful for her in a few months time. Ruby’s big sister likes it though! Rosie loves to play with pretend phones, keys and money, so this bag of treats is a great toy for her too. Rosie looked really sweet marching around with the bag. I think both my girls will get quite a bit of use out of this Bubbabag. I’ve also just spotted that Gumigem now sell a tool bag too … I think I know a few little people that would love that, but I won’t name them here incase I get them one for a present! I just want to say a big thank you to the lovely Jenny at Gumigem for the brilliant things we have been lucky enough to try out. Jenny has kindly also given me a Bubba bangle (the Earth colour) and a Button pendant (the Splash colour) to giveaway to two lucky readers of this blog! All you have to do for a chance to win one is ‘like’ the Gumigem facebook page, and also leave a comment in the box below on this blog post. That’s it! super simple. Two names will be drawn at random on Tuesday 30th September. The first name will receive the necklace, the second name will receive the bangle. If you fancy treating yourself or someone else to a fab Gumigem you’ll be happy to see that Gumigem has given me a special discount code to give to my readers … it is: GLR15 – this code is for 15 % off, valid until midnight Novemeber 30th 2014. I must admit I’ve been slightly worried about the day that Ruby will want to eat solids. 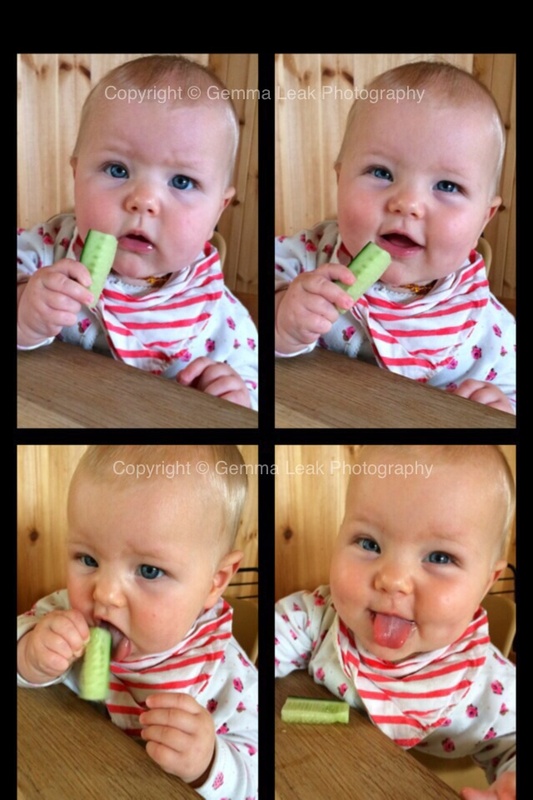 I’m going to do BLW (baby led weaning) with Ruby. So I’m avoiding mush and slop and going straight to the finger foods! 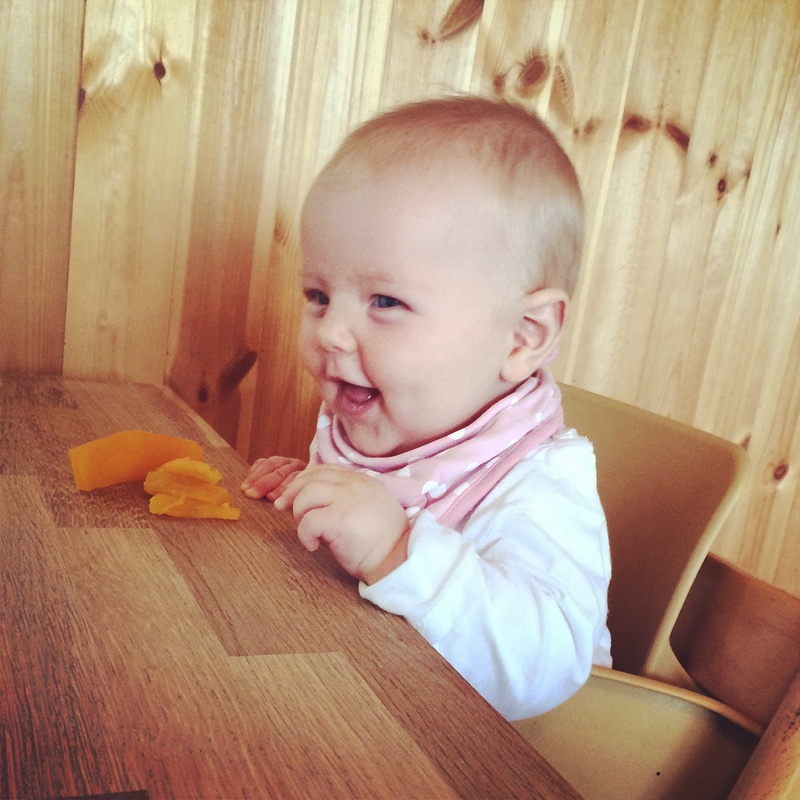 I’ve learnt that babies are less likely to choke if they are left to choose when they start to eat and are just offered proper pieces of food (rather than purée) – Apparently if they can pick something up and put it in their own mouth then they are ready to eat. It’s also good to wait until they are sitting well and holding themselves upright unaided. 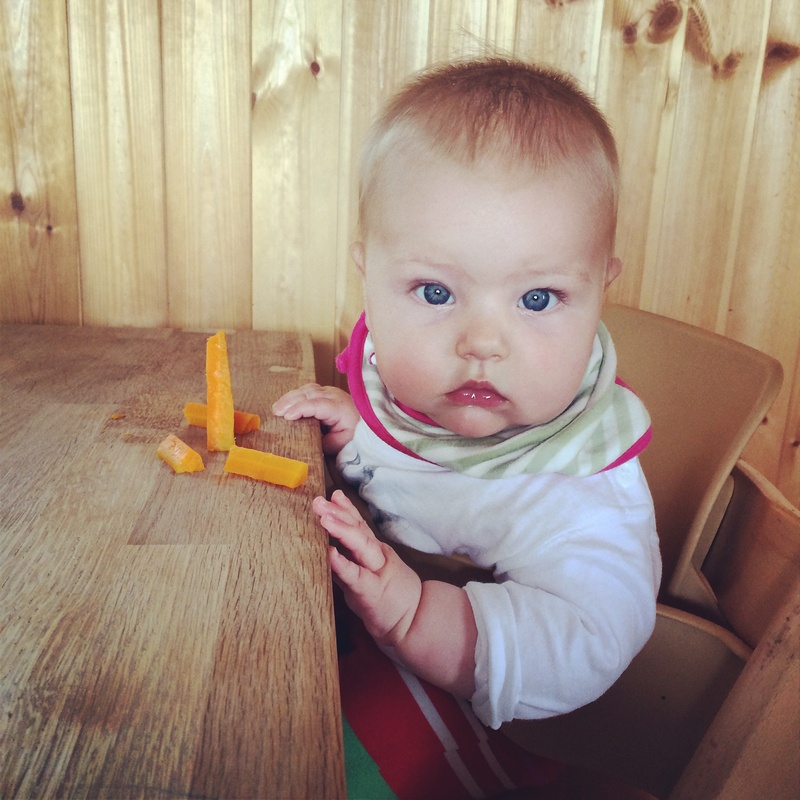 So at lunchtime today I popped Ruby in the highchair and put some soggy carrot sticks in front of her. Her reaction is shown in the image above! She showed no interest in the carrots and looked a little baffled. I was actually relieved. Then later today I tried placing some sweet potato chunks in front of her. She found this hilarious and gave it a little mush with her hand but that was it. So I think I can safely assume that Ruby is not quite ready to eat yet. Or perhaps she just didn’t feel like attempting it today. She’s thriving on breast milk so I’m not going to worry. I’ll keep you posted with our progress. Are you doing BLW? Could you share any hints, tips and experiences with us on here? Feel free to leave a comment in the box below. 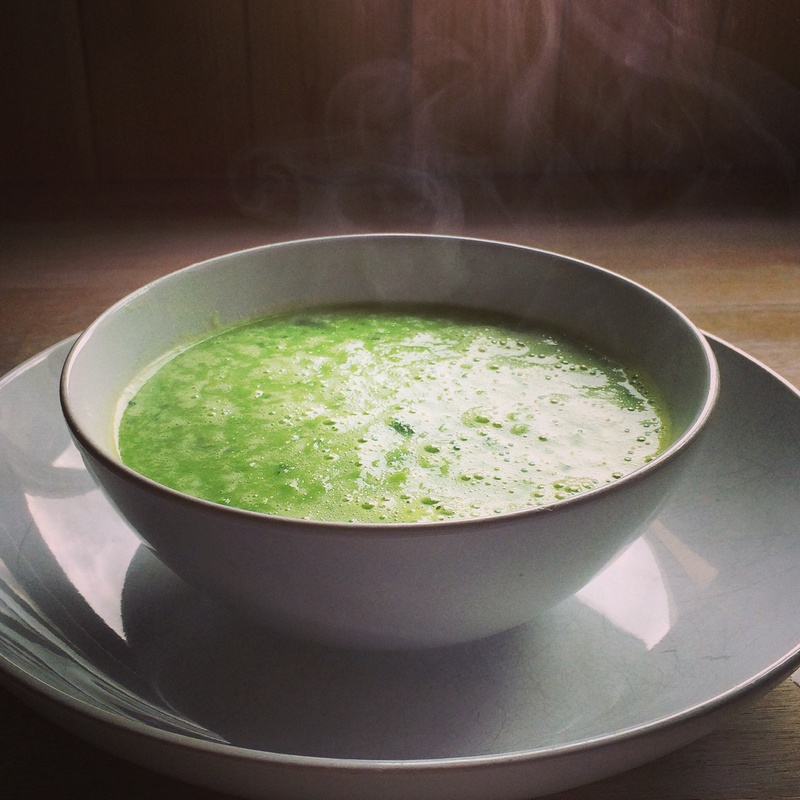 One of my favourite and super easy to make lunches is pea and mint soup. Gently simmer some onion ( & occasionally garlic too) in a little olive oil for a couple a couple of minutes. Add frozen peas, cover with boiling water, add some stock granules and bring to the boil. Then add some fresh mint. After a minute or so whizz it up in a blender and season to taste if required. That’s it! Mega simple, super healthy and really delicious. It also works great with some cooked ham chucked in too. This 16 week growth spurt is lasting forever! Today I am tired, actually that’s a total understatement … I’m feeling unbearably sleepy and absolutely worn out. When expecting a baby you mentally get prepared to be really tired in the first few weeks – knowing that the baby will need feeding every 1 to 2 hours throughout the night. 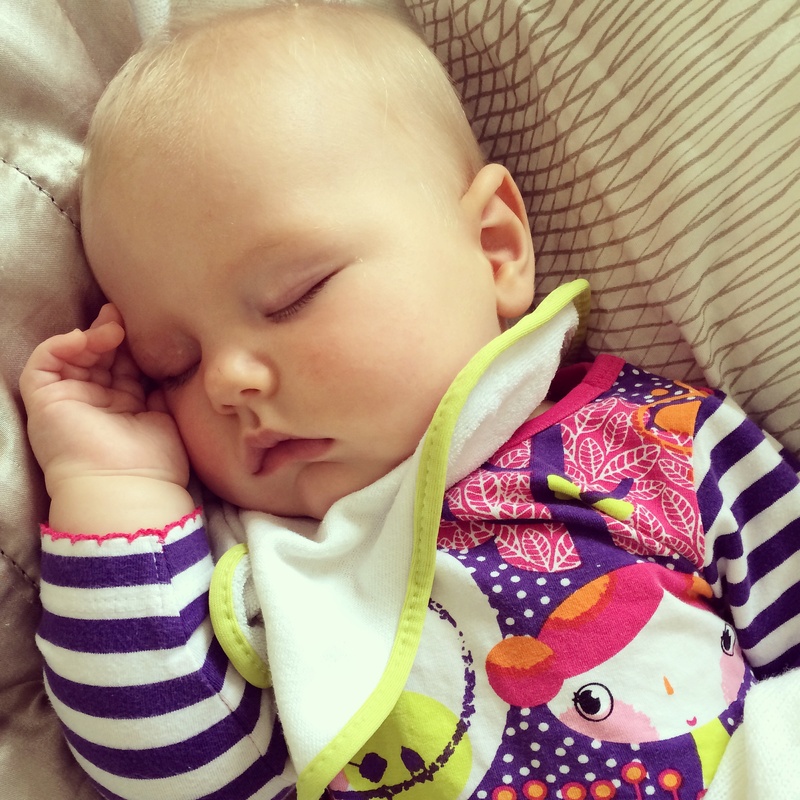 Baby Ruby slept pretty well after the first few sleep depriving weeks but since turning 16 weeks old she has reverted back to needing feeding every 1 to 2 hours through the night! I’ve recently learnt about the 16 week growth spurt that normally lasts anywhere between 1 to 5 weeks. I’m not sure Ruby has read about these rules! She is going to be 21 weeks on Saturday and we’re still in the midst of this hourly waking up throughout the night. It’s exhausting but I’m determined to carry on breastfeeding. 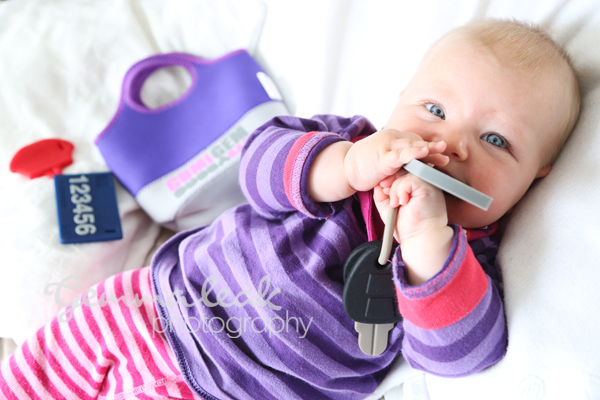 I was disappointed that I only managed to breastfeed Rosie until she was 16 weeks. Like Ruby she suddenly started feeding every hour again throughout the night. At that time I was clueless about the common growth spurts and how they can temporarily affect feeding routines. I just thought I wasn’t making enough milk and that Rosie would be more fulfilled with formula. So sadly I quit breastfeeding and began the formula feeding. This brought about a whole new range of problems due mainly to a cows milk intolerance which caused eczema and tummy problems. Right now it’s 8.49pm and I’m thinking I really should get to sleep. Secretly hoping that tonight will be the night that I get at least a three hour stint of shut eye! Thanks for reading my rather random ramblings. We love to bake in our house. It’s also a good way to entertain Rosie for a little while! Line a baking tray with baking paper. I always leave extra paper coming out over the edge of the tray at both ends so I can easily lift the flapjack straight out to cool. Then take off the heat, add one tsp ground cinnamon, 1/2 tsp baking powder, 2 mushed up ripe bananas and a handful of raisins. Then finally add 350g porridge oats. I usually add a few extras including: pumpkin seeds, chopped dates, sesame seeds, chopped nuts … I’m sure chocolate drops would be yummy too! Bake in oven at approx 160c (fan oven) until you start to see the edges go a light brown and the raisins start bulge. Remove flapjack from baking tray and gently press a sharp knive in to the flapjack to mark slices as required. Then leave to cool. 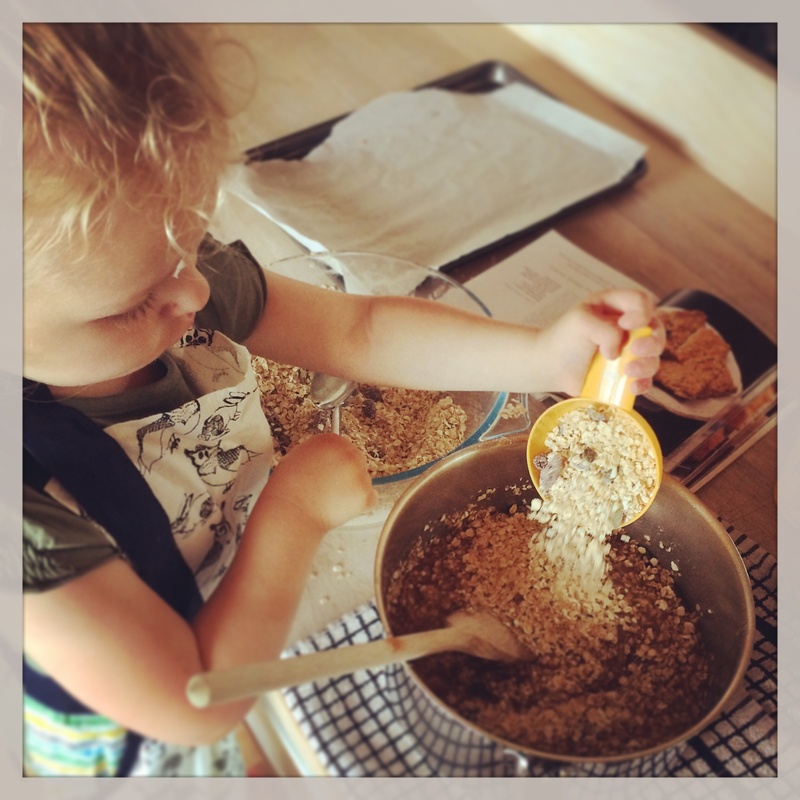 If you find any other delicious flapjack recipes please share with me! 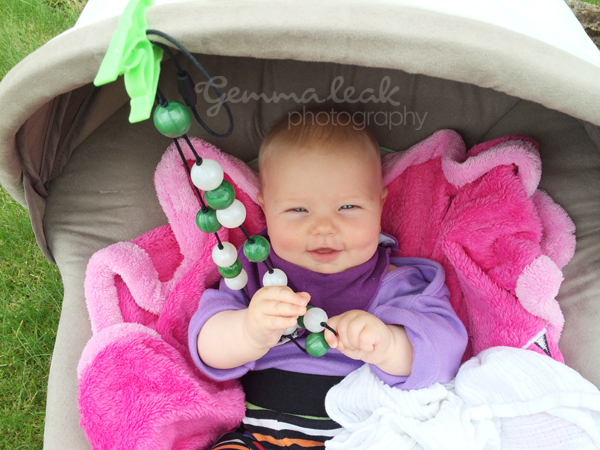 Natural pain relief for baby’s teething pain … Plus a gorgeous giveaway! 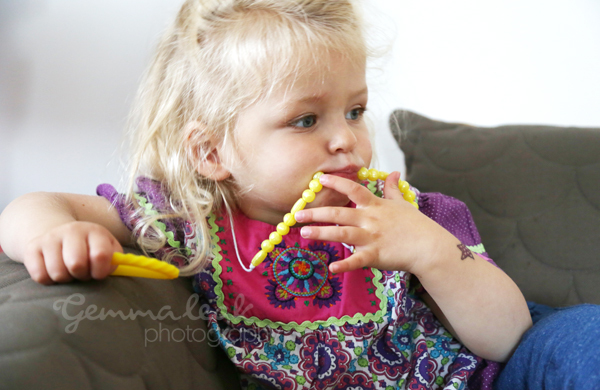 I like to use baltic amber to help relieve my babies with their teething pain. I used a baltic amber necklace for Rosie and we really didn’t have much trouble at all with getting her through her teething times. I don’t have any scientific based facts or reasons for why baltic amber works but from my own experience I think it really helps. I also believe that it can’t do any harm to use it, and if it helps at all then it’s worth it. Give ‘baltic amber’ a google and you’ll find information about how its the succinic acid, within the amber that works as a natural pain reliever and anti-inflammatory. 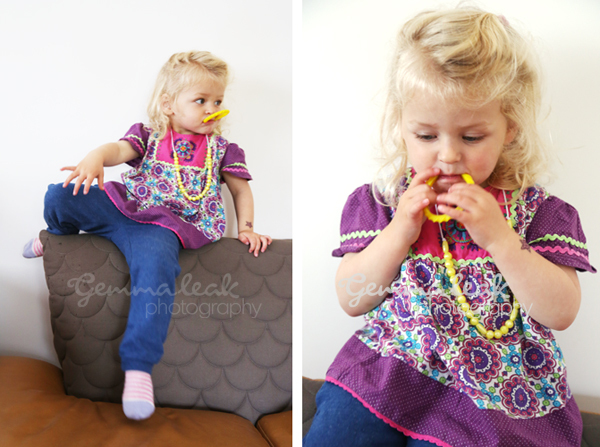 Bijoů žemè have also sent me a beautiful baltic amber baby anklet to give away to one of my lucky blog readers! … All you have to do for a chance to win it is two simple things: Firstly please ‘Follow’ my blog. (See the ‘follow’ link under the categories on the right hand side of this page.) 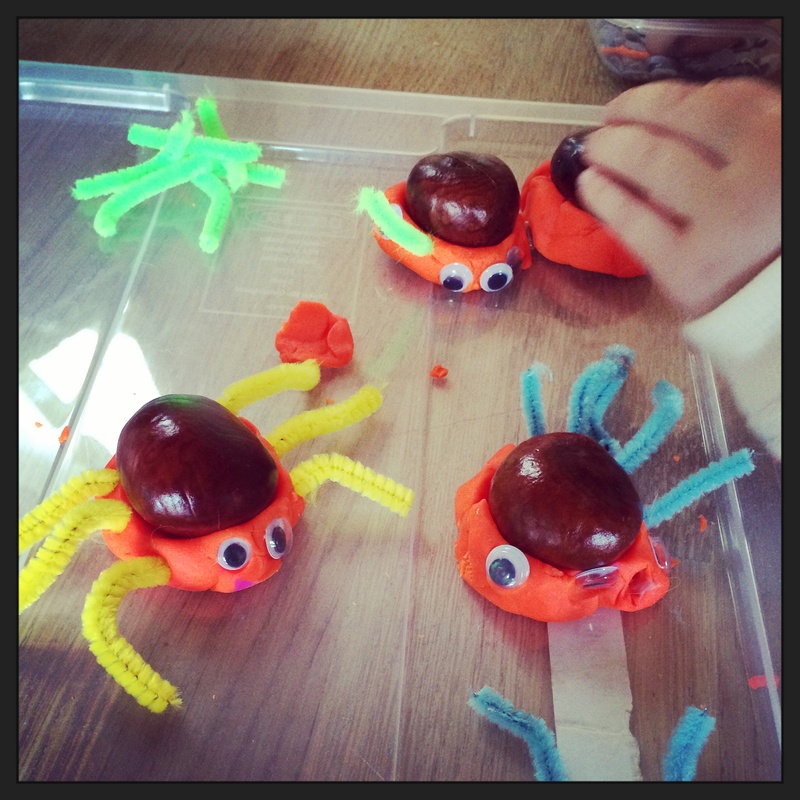 and secondly, please leave a comment on this blog post. A name will be selected at random on Sunday 31st August. Good luck!